David Greig has announced his first season as artistic director of the Royal Lyceum Theatre in Edinburgh, including four world premieres. Greig will adapt Aeschylus’ The Suppliant Women, while there are also new plays by Douglas Maxwell and Linda McLean, and a new version of Alice’s Adventures in Wonderland by Anthony Neilson. The season also includes a new production of April de Angelis’ Jumpy, directed by Cora Bissett. 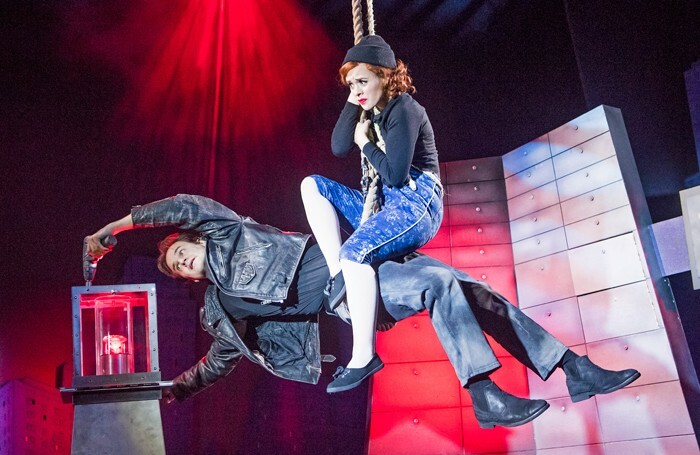 The Comedy About a Bank Robbery has extended its run in the West End by six months until April 2017. The show, which opened at the Criterion Theatre on April 21, will now run for a full year, until April 23, 2017. The Railway Children is to host a relaxed performance in June. The show, which is running at theKing’s Cross Theatre in London, will host the special event on June 22. The production will be adjusted for the performance, which is designed to benefit audience members with autism, sensory and communication disorders or learning disabilities. A new Philip Ridley play is to be staged in a secret location in London, in what is being described as one of the largest ever Off-West End productions. Karagula will run from June 10 to July 9, with a press night on June 15. Damien Moloney is to join the cast of No Man’s Land, starring Ian McKellen and Patrick Stewart. Moloney completes the cast of the production, which will tour the UK as well as running at Wyndham’s Theatre in the West End later this year. Jamie Muscato is to star in the London premiere of A Subject of Scandal and Concern next month. The revival marks the first time the show has played in London. It runs at the Finborough Theatre from May 22 to June 7. Alexander Zeldin’s Beyond Caring is to tour the UK this year. The show, which ran at the National Theatre in 2015, is devised and directed by Zeldin and will tour to venues including Birmingham Repertory Theatre, Theatre Delicatessen Sheffield and Home in Manchester from June 7 to July 17. The world premiere of a new play inspired by the current refugee crisis is to premiere at the Arcola Theatre in July. Cargo builds on the experiences of those forces to flee their homes and runs at the east London theatre from July 6 to August 6, with press night on July 8. A new play by Torben Betts is to open the summer festival at the Stephen Joseph Theatre in Scarborough. The National Joke runs in rep from June 8 until August 20, with press night on June 10. Full casting has been announced for Monster Raving Loony at the Soho Theatre. Samuel James reprises his role alongside original cast members Joseph Alessi, Joanna Brookes, Jack Brown and Tom Attwood. They are joined by Vivienne Acheampong. The production runs from May 14 to June 18, with press night on May 17. The cast has been announced for Savage, which opens at Above the Arts Theatre in July. Gary Fannin, Alexander Huetson and Nic Kyle lead the cast and the show previews from June 29, running until July 23. Press night is on July 1. Julie Atherton, Clare Foster, Alistair Brammer and Fra Fee are to star in a concert celebrating the work of US composer and lyricist Adam Gwon. Gwon, who has penned shows including Ordinary Days, will appear as part of the show on May 12 at the St James Studio, presenting songs from productions he has penned. Other performers taking part include Helena Blackman, Stuart Matthew Price, Cassie Compton, Alexia Khadime and Lee William-Davis. Nicholas Afoa is to take on the role of Simba in the West End production of the Lion King. The New Zealand-born performer joins the cast from May 10, alongside 15 other new cast members. The Lion King is running at the Lyceum Theatr and currently booking until October 2. Broadway performer Tituss Burgess will perform in London for the first time at the Hippodrome Casino. Known for his roles in Jersey Boys, The Little Mermaid and Guys and Dolls, Burgess – who also appears in Netflix series Unbreakable Kimmy Schmidt – will perform on September 22 and 23. Norma Jeane: The Musical will run at the Lost Theatre in south London later this month. The show, based on the life of Marilyn Monroe, runs from May 30 to June 18, with press night on June 1. A stage adaptation of comic strip family The Broons is to tour Scotland later this year. The Brooms will open at Perth Concert Hall on September 27, before touring locations across the country until November. A one-woman version of Richard III is to run at the Lion and Unicorn Theatre later this month. Starring Emily Carding, the production premiered in Iceland in November 2014 and will ru in London from May 16 to 28. Work by Hofesh Shechter and Richard Alston lead the dance line-up of this year’s Latitude Festival, as part of a programme by Sadler’s Wells. Jane Horrocks and the band from Young Vic show If You Kiss Me, Kiss Me have also been added to the theatre programme for the festival, which runs in Suffolk from July 14 to 17. Choreographers Lynne Page and Botis Seva and English New Ballet Theatre will also perform. Scottish Opera has commissioned Vanishing Point‘s artistic director Matthew Lenton to co-create The 8th Door, a prequel companion piece to Bartok’s Bluebeard’s Castle for its 2016/17 season. The opera will receive its world premiere in Glasgow in March 2017 alongside a new production of Bluebeard’s Castle, also directed by Lenton. The season also includes productions of Pelleas and Melisande, La Boheme, The Elixir of Love and The Trial. A new opera abase on Hamlet will feature on the line-up for the 2017 Glyndebourne Festival. The season also includes the UK’s first production of Cavalli’s Hipermestra, directed by Graham Vick, as well as revivals of Revivals of La traviata, Don Pasquale and Ariadne auf Naxos. Glyndebourne will take place form May 20 to August 27, 2017.